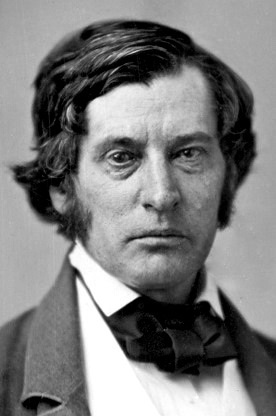 Charles Sumner damned Stephen Douglas as a Northern man with Southern principles, a doughface, for his Kansas-Nebraska Act. Douglas hit back, noting how Sumner had gone in all of a year from castigating the Compromise of 1850 to praising it as restoring the peace that Kansas-Nebraska would undo. The Massachusetts Senator had such purity of principle that he supported an old proslavery hand like Martin Van Buren for president in 1848. But Sumner’s oratory left a mark. Even a senator from North Carolina congratulated Sumner on everything about it save choosing the wrong side. The Masachusetts papers lit up with praise for Sumner again. The satisfaction reached even into Bay State Whiggery. 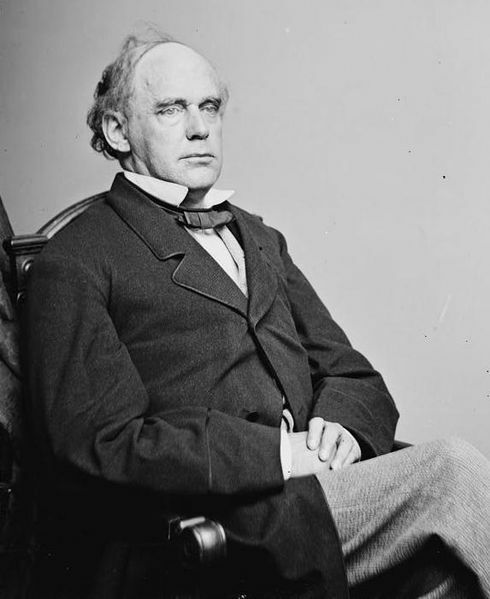 The Massachusetts Whigs supported the Compromise of 1850 with held noses, taking the lump on Daniel Webster’s word that they had to do it to save the nation. With the South bent on new conquests, Godlike Daniel safely in the ground, and land that Massachusetts farmers might want to move off to at stake, the situation changed. They turned on their man in the Senate, Edward Everett, when he came out against the bill in a late and feeble manner. Kidney stones took him off the floor for a vote and his former supporters mocked him for it. Adoring letters poured in for Sumner from old allies and former Everett men alike. Delighted, Sumner read them aloud to the Sewards. Inspired, he even entered into spontaneous debate for a while. The Kansas-Nebraska Act became law all the same. When the Anthony Burns affair erupted at almost the same moment, proslavery men blamed Sumner for inciting riot in Boston with his speeches in Washington. Sumner received threats on his safety, which prompted a future governor of Connecticut to offer his services as a bodyguard. Less reassuringly, a correspondent informed the Senator that if he died he would become a martyr to freedom. Sumner, a large man, responded to the threats on his life by ensuring they reached the attention of the newspapers and otherwise ignored them. He walked about Washington, never a friendly place for outspoken antislavery men, unarmed and unaccompanied. He looked forward to stepping up his rhetorical attacks on slavery, but his new colleague from Massachusetts -Everett resigned courtesy of those kidney stones- got the jump on him with a new petition for repealing the Fugitive Slave Law. He promptly withered under a counterattack built around the fact that some of the signers participated in Burns’ rescue. Sumner stepped in to defend him. As Sumner finished up his latest condemnation of the law, Andrew Butler came into the Senate chamber. He listened to his friend and the proverbial steam shot from his ears. 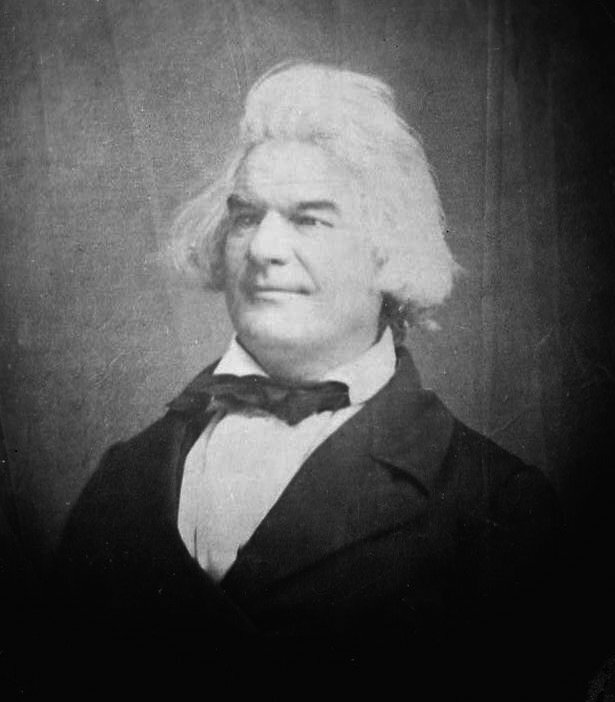 Denouncing Sumner’s speech as one not becoming the Senate, he demanded to know if Massachusetts would render over a single fugitive if the Congress repealed the law. The state had a constitutional obligation, so would it do its duty? Trial or no, whatever process instituted, would Massachusetts deliver a person into slavery or would all that folderol just obscure a flat refusal to abide by the Constitution? Sumner answered, “Is thy servant a dog, that he should do this thing?” Then the fireworks really started. Sumner profaned his oath to support and defend the Constitution. He had gone mad. The Senate should expel him. 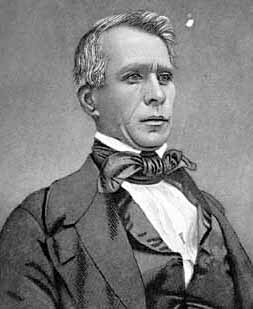 Sumner fought back, castigating his critics as men of “plantation manners” who treated the Senate itself like answered to their whips. The vicious debate spawned serious talk of expelling Sumner as a perjurer and traitor, but the matter dropped when the adherents learned they lacked the necessary majority. We have followed Charles’ Sumner’s career in the Senate all the way to the fall of 1853. At the end of it all, his coalition lost their majorities in Massachusetts. They blamed Sumner’s refusal to campaign for the party. Under their increasing criticism Sumner took out his frustrations on a friend of his, Francis Lieber. It must have seemed likely he would serve only the one term, or less. The elections trimmed the Free Soil Senate caucus by half, leaving only Sumner and Salmon Chase in the chamber. He had no committee assignments. People suspected he would resign rather than spend four years in futile opposition to the Pierce Administration. The new Congress met for the first time in December of 1853. Augustus Caesar Dodge submitted a bill for the organization of the Nebraska Territory, west of Missouri. 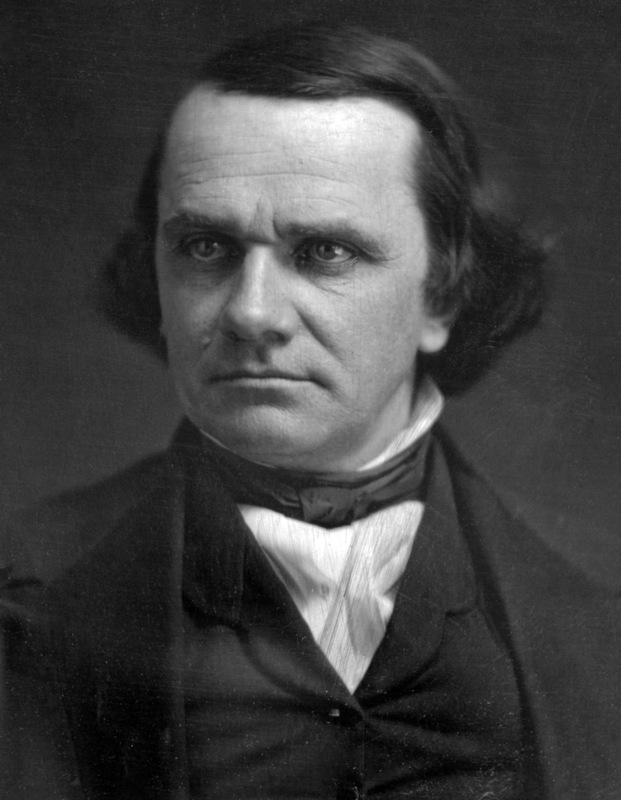 Stephen Douglas had big plans for that land: a Pacific Railroad, reunification of the Democracy, and four years in the White House just to start. Come January, he sought out David Rice Atchison to see what the Senator from Missouri would need in order to allow a new territory so near to Missouri’s plantation country. Atchison wanted repeal of the Missouri Compromise. Sumner smelled a rat in all the quiet negotiating Douglas got up to and put his head together with Salmon P. Chase and Joshua Giddings. Giddings wrote the original draft of the Appeal of the Independent Democrats, which Chase revised and Sumner gave some rhetorical embroidery. He and Chase asked Douglas to delay his bill a week so they could get their message out, claiming that they wanted to study the territorial issue more. The Appeal hit the newspapers that day, after Douglas agreed to the pause, and the Little Giant girded for battle. Sumner tried to argue he arraigned the act, not its author. The Appeal might call Douglas an accomplished architect of ruin, but nothing personal. He went on to call the act “a soulless, eyeless monster-horrid, unshapely, and vast.” For some reason, Douglas didn’t buy that. 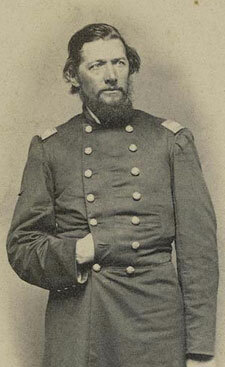 The Appeal focused his attacks on Chase and Sumner, who thus inherited leadership of the anti-Nebraska side. Neither conservative Whigs nor established antislavery men took a major part. William Seward, the horrid antislavery radical of 1850, delivered only a single speech against the act. loosens and destroys the character of Northern men, even at a distance-like the black magnetic mountain in an Arabian story, under whose irresistible attraction the iron bolts, which held together the strong timbers of a stately ship, were drawn out, till the whole thing fell apart, and became a disjointed wreck. You could do the math yourself, but Sumner spelled it out all the same: Slavery drew the iron principles right out of Stephen Douglas and company, creating “that human anomaly-a Northern man with Southern principles.” Applause rained down from the Senate gallery. The Eldridges, who had gone to Lecompton to plead the case of their hotel furnishings and the Lawrence that surrounded them, got nowhere. J.B. Donaldson would promise only that he would not destroy the Free State Hotel. Wilson Shannon, when offered everything he had ever asked of the free state party, still declined to order out the Army to preserve the peace. When they told the Governor that this might drive Lawrence into resistance by force, Shannon declared himself for war. whereupon the men raised their pieces and threatened to shoot him unless he gave it up. The person in the store again got it, when an altercation between him and the two men ensued. Jones took that moment to claim the better part of valor, leaving the store while the fight progressed. 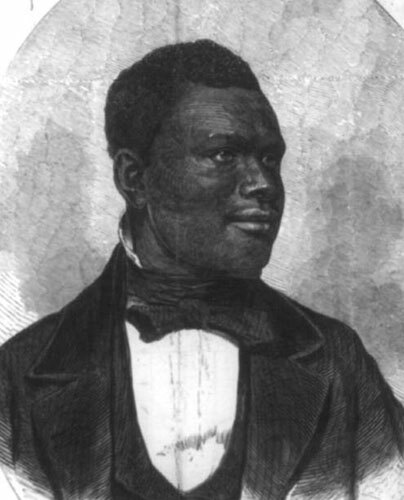 For his heroism, Jones received pursuit by the two proslavery men, who swore that an abolitionist would not escape them. They fired at him; he fell mortally wounded, and died during the day, or before next morning. The murderers immediately left. Through the long build-up to this, many people had faced deadly threats and harassment. A messenger from Lawrence had dodged bullets as he rode. Proslavery men had detained others and warned uninvolved parties that they could not travel safely. Now a man had died, the first political murder in Kansas since Reese Brown in January. I must begin with a confession, Gentle Readers: I screwed up. I started out working through the petition that the people of Lawrence sent to Franklin Pierce and all its included correspondence, which I introduced as such at the time. Over the course of a long weekend and getting more than a little lost marveling at all the trees, it slipped my mind that I had not actually left the memorial’s text behind. I have worked before with executive minutes and other collections of correspondence presented similarly to the memorial, and in the same volumes, and started thinking of the documents on those lines. In so doing, I lost track of who produced the writing and so ended up musing about the nameless compiler and his unusually sharp voice. For the record, both of the previous posts hail from the memorial’s text and deserve reading as the words of interested parties from Lawrence: J.M Winchell, Lyman Allen, S.B. Prentiss, L.G. Hine, Joseph Cracklin, John A. Perry, O.E. Learnard, S.W. Eldridge, and C.W. Babcock. I don’t think it much changes my analysis of yesterday’s material, but one should always keep the partiality of one’s sources in mind and I nodded off. That’s on me. Continuing with the memorial then, we left with J.B. Donaldson and Wilson Shannon giving the Eldridges a series of contradictory and useless answers to the problem of the proslavery army aimed at Lawrence. They told the furnishers of the Free State Hotel that the posse Donaldson had summoned against Lawrence intended to work some mayhem. They would like to guarantee the safety of the hotel, but would not lift a finger to save the newspaper presses. Nor would they, despite agreement from Lawrence to disarm and submit, accept men of the town into a posse to use as a safe substitute for Donaldson’s bloodthirsty Missourians. he said the people of Lawrence must take such consequences as should ensue; that he could protect them with the United States troops if he chose, but that he should not do so. The people of Lawrence gave up. They promised no interference with J.B. Donaldson’s posse. They would accept the legitimacy of Wilson Shannon’s territorial government and all its works. They would even give up their weapons, surrendering the lot to E.V Sumner if the 1st Cavalry as soon as he dispatched men sufficient to guarantee their safety. Everything that proslavery party wanted out of the town except its destruction and the murder of every man, woman, child, and livestock present, offered up for the Governor’s and Marshal’s approval. Those worthies need only take yes for an answer. it was said that a portion of the posse was clamorous for the destruction of the hotel and the printing offices; and the Messrs. Eldridge were invited to return again on the following day, after time had been afforded for consultation with the captains of the companies. At this point, the compiler of the papers notes that both Eldridges remained under guard the entire way to and from Lecompton. In dismissing them, Shannon and Donaldson wrote them a safe conduct. found a great change in the tone of the officials. It appeared that the companies composing the posse would be satisfied with nothing short of some destruction or private property, and this feeling was so strong as to defy the power of the Marshal. They would not let Shannon play Lucy with the football another time. It was evident that a course of violence was resolved upon. One of the captains -a Colonel Titus, of Florida, a member of the late expedition against Cuba-declared boldly, that the printing presses must be destroyed to satisfy the boys from South Carolina. The incongruities of these various statements it is not for us to reconcile. The building itself was the property of the Emigrant Aid Company, but it had been furnished by the Messrs. Eldridge, at heavy expense, and was not yet opened as a public house. against the laws or officers in the execution of the same; therefore, having no further use for them when our protection is otherwise secured, we propose to deliver our arms to Colonel Sumner so soon as he shall quarter in our town a body of troops sufficient for our protection, to be retained by him as long as such force shall remain among us. That comes close to total capitulation. The free state men said they would give up their weapons, the very thing Shannon had asked of them in order to receive protection. He could have a disarmed opposition, pledged now to submit to all the laws of Kansas. That would mean the effective end of the territory’s antislavery movement as a political force, though Colonel Sumner’s men would ensure the physical safety of its members in Lawrence. Shannon could have everything he wanted since the day he set foot in Kansas, free and clear. He and Donaldson only had to take yes for an answer. From William Phillips, we know that people moving around Lawrence suffered harassment and risked their lives at the hands of proslavery forces converging on the town. The newspapers reported that even a messenger sent from the town to Governor Shannon dodged bullets on his way back. J.B. Donaldson’s posse had begun its unofficial work, at least. With the town’s pleas for help refused or left unanswered, things looked grim. People of less prominence than reporters for the Eastern papers and intimates of the free state government agreed. Thank them a thousand times for me, and beg them always to remember me when they render up their petitions to Him who rules and governs all things. I feel that I need the prayers of everyone. 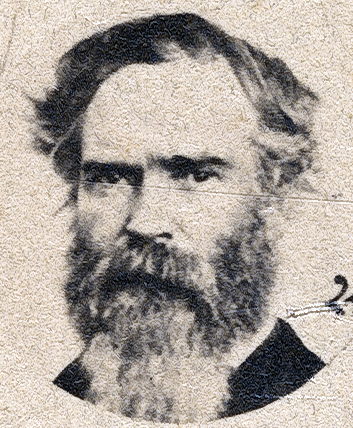 Hoole had not set aside his politics when he moved to Kansas. He reported Jefferson Buford’s arrival in the territory and his intention to call on the filibuster, who just then resided at the house of his neighbor. While I am writing, guns are firing in the camps of the different companies of soldiers who are gathering to attack Lawrence. Sunday as it is, they are shooting in every direction. I expect before you get this Lawrence will be burnt to the ground. I may not know when it will be attacked, but if I do, I expect to go-although I don’t think that they will show any fight, though they are preparing. But I hear they are very much frightened and have sent to the Governor for protection, but he sent word to them that they did not consider him their Governor and would not submit to the laws, so he would leave them to their fate. Hoole wrote from Douglas, not far at all from Lawrence. If he knew of the shooting, then the town can’t have long remained ignorant. Of course Hoole doesn’t know if they shot at anything in particular just from the reports. Most likely, a group of well-lubricated men with guns found ways to amuse themselves that didn’t necessarily put bullets in the bodies of their enemies. Shooting for fun didn’t preclude shooting for purpose soon enough, though little daylight may have separated the two for many. On the other side of Kansas politics, Edward Fitch wrote his parents on the same day from Lawrence itself. He complained that the surveyors had come through and ran a line straight through his house, which may mean that when he went to claim his land he would get half a building. But his neighbor didn’t live on the claim, so Fitch thought he had a good chance to prevail. but having a claim is not going to do me any good if I don’t live and we don’t know how soon now we may be cut off. We are surrounded by an armed mob and they may attack us at any time and in our present condition we stand a chance to be wiped out which is what they say they are going to do. We never have been quite so near war as we are now. Fitch arrived in Kansas, courtesy of the Emigrant Aid Company, in October of 1854. He lived in Lawrence from that point on, so he knew the Wakarusa War firsthand. For him to consider this the nearest they had yet come to destruction speaks volumes. He apologizes to them for infrequent writing and saying so little, on account of the “fevered excitement” and begs more letters from home. The people of Lawrence had few options. At this time of year, many of the men who might have come to their defense would have work on the farm that they would find hard to delay. Even if they came, the town appeared short on guns and still owed the merchants who had forwarded them provisions for the Wakarusa War. Furthermore, J.B. Donaldson’s proslavery army styled itself a militia clothed in the authority of his post as US Marshal. Wilson Shannon would not intercede on their behalf. E.V. Sumner, of the 1st Cavalry, could not act without the governor’s permission. Direct appeals to Donaldson had failed. Proslavery men detained people coming and going about the unofficial free state headquarters. The committee on safety could not settle on a course of action. a large force of armed men have collected in the vicinity of Lawrence, and are engaged in committing depredations upon our citizens; stopping wagons, arresting, threatening, and robbing unoffending travellers upon the highway, breaking open boxes of merchandise, and appropriating their contents; have slaughtered cattle, and terrified many of the women and children. Probably they had no shortage of terrified men on hand too, but nineteenth century masculinity demanded they forebear in silence and make their pleas on behalf of others. We have also learned from Governor Shannon ‘that there are no armed forces in the vicinity of this place but the regularly constituted militia of the territory; -this is to ask if you recognize them as your posse, and feel responsible for their acts. If you do not, we hope and trust you will prevent a repetition of such acts, and give peace to the settlers. Here Lawrence might turn Shannon’s inaction to their advantage. He insisted no one but the posse operated near Lawrence. Donaldson admitting that he had a posse meant for the town. If he took claimed those proslavery men harassing travelers and stealing whatever they liked as that posse, then he owned their various misdeeds. If he did not, then he might have a duty that he had recognized himself in previous correspondence to preserve law and order. Thus the Marshal may have to disown the army, and so oblige himself to work against it, or claim the posse and work to control it. All of that sounds good on paper, but it does require Donaldson to have scruples not otherwise in evidence; he failed to even write them another hostile answer in the vein of the one he had given before. The committee of safety had to expect little to nothing when they wrote the letter. One can’t read it and not feel the desperation of the authors. If the Marshal himself didn’t, or couldn’t, save them then it may all soon come to ruin. Their argument had logical and moral force, but those might prove of aid only to their eulogists. Josiah Miller beat his rap for treason against the state of South Carolina, the place of his birth. The South Carolinians who found him alive while antislavery in Kansas didn’t care much about jurisdiction. That happened on the return leg of his trip with some other free state men to plead with Governor Shannon. A proslavery army bent on their destruction even then massed against Lawrence. William Phillips doesn’t give firm dates for all of this, but it must have happened on or shortly after May 15, 1865. Also around that time, he reports that proslavery men stopped another suspicious character on the road. Phillips doesn’t report the soldier’s answer, but it and the uniform appear to have settled the mob on letting him go. Weaver would have to stay, which he did not care for. Instead, the sergeant-at-arms presented his identification. The proslavery men had apprehended two United States officers in the course of their duties and had best let both go at once. His papers got a very critical examination before the captain first; then something that passed for a major, and finally every ruffian, gentle or simple, had to have a peep at them. Peeping did not change minds. Instead, they took Weaver before their overall commander, a Colonel Wilkes. Wilkes turned to a General Craimes, who had a peep of his own. After giving Weaver’s papers a thorough and critical investigation, the colonel, with his general, pronounced them “all very good,” and expressed as their opinion that he ought to be permitted to pass. The colonel very considerately suggested to Mr. Weaver that, if he was hailed by any party, he had better answer promptly; otherwise he might be shot. J.B. Donaldson told Lawrence that the innocent had nothing to fear from him. His army, alias posse, would only pose any danger to those that his duties required him to apprehend and those resisted him in the course of those duties. That meant the free state leadership, all of whom had warrants for their arrest courtesy of Samuel Lecompte’s grand jury, and anyone in Lawrence who helped them. Listing those people by name may not return a list of the entire population of Lawrence as of May, 1856, but it would probably come close. Just as Donaldson would not take philosophically the threat to his life if he tried to come into town on his own, he people of Lawrence could not adopt a disinterested position toward an army converging on them and bent on their destruction. They had appealed to the military, to Governor Shannon, and finally to Donaldson himself to no avail. Running out of options and unsure they could pull off an armed resistance, it seems that some tried Shannon again. William Phillips reports that shortly after Captain Walker’s harrowing escape with Shannon’s reply to the town, a new embassy went up to Lecompton to plead Lawrence’s case. Carmie Babcock, William Y. Roberts, and Josiah Miller can’t have hoped for much. Phillips summarizes their success in four words: “They failed, of course.” Barely out of Lecompton on their way back, they fell prey to one of the armed bands harassing travelers. It seems that Roberts and Babcock secured swift release. Miller had a worse time of it. made up what they were pleased to to consider a court from amongst their own number, and, placing Mr. Miller before it, tried him for treason to South Carolina. After a hard effort some of the Carolinians, who knew him, and felt friendly, contrived to prevent his being hung, although he was found guilty. He got off after losing his horse and money. Phillips identified Miller’s captors as part of Donaldson’s posse. They probably also hailed from Jefferson Buford’s expedition. He doesn’t give many details of the event, but it sounds like Miller suffered a trial much like Pardee Butler’s. One could read his friends arranging an acquittal two ways: either the mob wanted Miller dead and a few friends pulled a fast one to save him, or they wanted him to think that happened and really meant to give him a powerful scare. Mortal terror could do much, then and now, to silence political opponents. The latter course may sound marginally more reasonable; terrorized people still live to see tomorrow. But its use does require the mob to share one mind on the subject. It only takes a few to translate threats into reality. To make such threats credible, they can’t lay far from what the mob might do anyway. Threading that needle, if they wanted to at all, required as much luck as conviction.